How much does it cost to travel to Salt Lake City? How much money will you need in Salt Lake City? $173 is the average daily price for traveling in Salt Lake City. The average price of food for one day is $19. The average price of a hotel for a couple is $201. Additional pricing is in the table below. These average travel prices have been collected from other travelers to help you plan your own travel budget. How expensive is Salt Lake City? Salt Lake City is the capital city of Utah and one of the largest cities in the southwest region of the US. Salt Lake sits on the border between the Rocky Mountains and Great Basin regions, making it the perfect place for outdoor activities. The city's natural beauty and resources even became the focal point for the 2002 Winter Olympics. Salt Lake experiences all four seasons, with the most popular times to visit being summer and winter. Summer, June-August, sees little rain and temperatures in the high 80's Fahrenheit. Winter, December-March, has temperatures in the 30's Fahrenheit and gets the perfect amount of snow for winter sports. Salt Lake City is a very historical area and features beautiful architecture throughout the city that represents its lengthy past. 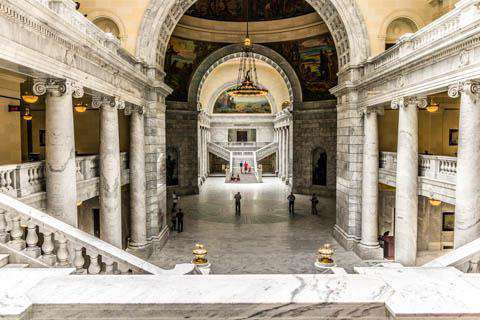 The Utah State Capitol Building is a magnificent space built in 1916 and features tours for visitors to explore the building and its history. One of the most beautiful buildings is the Grand America Hotel, a 5-star hotel that is considered to be one of the most beautiful city hotels in the world. The hotel has jaw-dropping, huge, chandeliers and even a million-dollar mirror. When you've finished exploring the city's architectural gems, head over to the Hogle Zoo which lies at the mouth of the Emigration Canyon and sits on 42 acres of land. During the summer, enjoy a stroll through one of the many parks, including Liberty Park which has a small amusement park and paddle boats to drive around the pond. Salt Lake City is divided into a few different neighborhoods, each with their own unique personality. The Downtown area is in the heart of the city and features art galleries, festivals, farmers markets, and plenty of lodging. Central City is home to Liberty Park and is often considered the headquarters for hiking and biking in the city and surrounding area thanks to all the gear shops there. Sugar House is one of Salt Lake's oldest neighborhoods, and most famous, thanks to its laid back vibe and slew of art galleries. Sugar House is also home to Sugar House Park which has 110 acres of trails, forests, and ponds. For the majority of your outdoor activities, head to Millcreek and Holladay which are the gateways to the Wasatch Mountains and other activities such as hiking and mountain biking. Salt Lake City's location in the midst of nature offers fantastic opportunities for outdoor activities such as camping, hiking, mountain biking, and boating. The city is also located near canyon hiking trails such as City Creek Canyon and the Red Butte Gardens which are great for novice and advanced hikers alike. During the summer, take a boat on the Great Salt Lake where you can travel to Antelope Island located on the lake and go swimming or hiking. In the winter, there are endless winter sports to enjoy and multiple world-class ski resorts. If you prefer something more relaxed, you can go on a Gallery Stroll in downtown Salt Lake and wander through the 20-plus art galleries and antique shops. One of Salt Lake City's specialties is called Fry Sauce, which is comprised of a combination of ketchup and mayonnaise, with some spices occasional added. The sauce was created by the local fast food chain, Arctic Circle, where you can enjoy the famous concoction. The city's restaurants offer a wide variety of cuisines, including Middle Eastern, Japanese, and American. Definitely check out Lamb's Grill, the oldest restaurant in Utah, it opened in 1919. Lamb's Grill serves American diner food with a historic atmosphere. Salt Lake has great places to relax and grab a drink, including The Bayou, where you'll find over 240 different kinds of beer from around the world along with creole food and live music. If you prefer something with a view, check out Gracie's where you can enjoy food and drinks on the patio that overlooks downtown Salt Lake and the Wasatch Mountains. Salt Lake City is served by the Salt Lake City International Airport where you can either rent a car to get into the city or take a shuttle bus. For something more scenic, you can drive, take a bus, or take the Amtrak train into the city. Getting around is fairly easy thanks to the city being set up on a grid system. You can get around on the bus or the TRAX, which is the city's light rail system. The city also features plenty of bike paths throughout downtown, making it the ideal place to get around on bicycle.